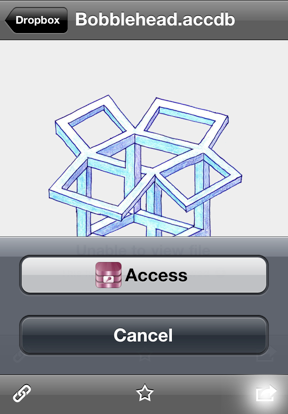 Microsoft access databases are stand-alone files, and so the database file must be transferred to your iOS device in order to open it in Access Mobile Database Client. This is in contrast to many other databases, which connect over a network in “client-server” mode. While having your database file on your device prevents the ability to work on the data concurrently with other users, it also allows you to work with your database in a disconnected environment, such as on an airplane. ⚠ Note: Access Mobile Database Client does not support encrypted Access database files. In order to open an encrypted file, you must first remove the decryption in the Database Tools menu of MS Access. There are two primary ways of transferring your database from your Windows desktop to your iOS device: mailing your database to yourself, and transferring the database from your desktop to your iOS device using iTunes File Sharing. 2.On your iOS device, open the Mail app and check for incoming mail. 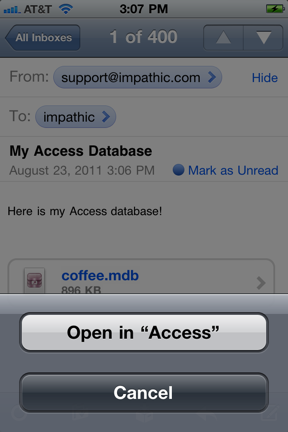 3.In the body of the mail, tap on the attached database file, and an option for “Open in Access” will appear. Tap the button, and DataGlass Mobile Database Client will be launched and the database will be imported. 1.On your desktop, locate your “.accdb” or “.mdb” database file. 2.Plug your iOS device into your desktop or laptop using the USB cable and open iTunes. 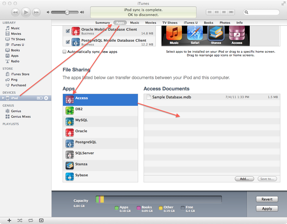 3.In the left panel of iTunes, locate and click on your iOS device name. 4.At the top of the screen for the device, select the “Apps” tab. 5.Scroll down to the “File Sharing” section at the bottom of the screen. 6.Select “Access” from the list of apps. 7.Drag your Access database from your computer into the file list. 8.When you next launch Access Mobile Database Client, you will see your database in the list of available databases. 1.Sign up for a free account at www.dropbox.com if you don’t already have one. 2.Upload your “.mdb” or “.accdb" file to your dropbox account using their desktop integration program. 3.Download the free “Dropbox” app from the Apple iTunes App Store, launch it, and log in. 4.Browse to your database file and tap the forward button , then select “Access” as the application to open the database with. ☞ Note: When you first select your database in Dropbox, the app may say “Unable to view file”, but you should still be able to tap the forward button to open it in Access Mobile Database Client. ☞ Note: Modifications made to your database will not be saved back to your Dropbox account, but instead will be saved locally on your iOS device. To get your modified database back to your desktop, you need to transfer it back using the iTunes File Sharing method, or by tapping “Edit” from the database list, selecting your database, and then mailing your database back to yourself, or opening it another application (such as the official “DropBox” app). 2.In the subsequent connection screen, enter the IP address or host name of the the database host. Consult your database administrator if you need this information. ☞ Note: if you enter a host name rather than an IP address, you need to make sure that the host name is able to be looked up by your iOS device. This is frequently a problem with host names on an internal network that are only identifiable from Windows machines. If you have problems connecting, find the IP address of the host and use that instead, or else contact your system administrator for assistance. 3.Fill in a valid User Name and Password for the database. ☞ Note: by default, SQL Server Mobile Database Client uses the native “SQL Server” authentication. If you need to use integrated Windows authentication instead, tap the “Advanced” button and fill in the “Windows Domain”. 4.If you want to connect to a specific database name, fill it into the “Database Name” field. ☞ Note: this is different from a SQL Server’s “Instance Name”, which you can enter from the “Advanced” button. 5.If your databases uses a non-standard port, enter it into the “Database Port” field. 6.Enter an optional “Description” if you want a specific description to show up for that connection in the databases list. 7.Enter any additional advanced connection information in the “Advanced” button, including timeouts, character encoding, and SSH Tunnel information. 8.Tap the “Save” button to save your connection. 9.Tap the resulting new entry in the databases list to make the connection. The first time you connect, it may take a little while to read in the schema and table information for the database. 10. Once connected, you can start browsing your data. 4.Enter the Oracle database identifier into the “Database SID” field. ☞ Note: If your Oracle installation uses a “Service Name” rather than an “SID”, you can specify to use the service name by tapping the “Advanced” button. 7.Enter any additional advanced connection information in the “Advanced” button, including encryption settings and SSH Tunnel information.